The grouting of machine base plates and the anchoring/alignment equipment to a foundation provides a strong and rigid support between a machine and the foundation. The foundation and the anchoring of machinery to the foundation are key elements in determining long term geometrical alignment and key machine performance results. Both of these are necessary to achieve the maximum machinery efficiency and uptime. A quality grout will not shrink and therefore ensure that critical alignments are maintained and maximum rigidity achieved. Choosing between either a cement-based grout or an epoxy product is an important decision when planning a machine installation. Typically, Unisorb V-1 Non-Shrink cement-based grout or V-100 epoxy grout will both provide beneficial long-range results in the same application. The following points describe several features of each of these products to consider when selecting between either grout product. Cost – When comparing equal volumes of cement & epoxy grouts, the epoxy is up to 6 times higher in cost. However, the volume required is much smaller when using epoxy grout. In a typical anchor bolt installation a 3” diameter hole used for cement grout would only require a 1 ½” hole for the use of epoxy grout. This reduces the volume by 75%, thus reducing the material costs. Time Constraints – When time is an issue consider the following. Cement-based grout should have a 24 hour cure time before work continues with a 3 day cure before final alignment. In comparison, V-100 epoxy grout is stronger than V-1 cement grout in less than 8 hours and final machine alignment can usually be done in 24 hours. 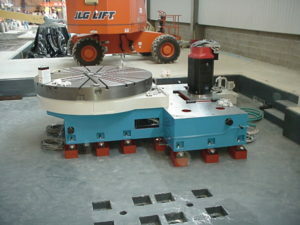 Working Time – V-1 cement grout allows 30-45 minutes in which to finish pouring while V-100 epoxy allows 10 – 15 minutes. Most V-100 3-Part epoxy grouts used for deep pours allow 45 – 60 minutes. Temperature – The higher the temperature the faster the grout cures. V-1 cement or V-100 epoxy grout can be installed when temperatures are between 45˚- 90 ˚ F, however, precautions must be taken when pouring below 60 ˚ or above 80 ˚ F. After cure V-1 cement-based grout is suitable for elevated temperatures as high as 1000˚ F with little loss in compressive strength. V-100 epoxy grout has a maximum service temperature of 150˚ F.
The concrete surfaces to which the grout will be applied must be clean and free from debris. If unsound concrete is encountered, it will be necessary to chip back to sound concrete. If using V-1 Cementitious grout be sure to pre-wet all concrete surfaces 24 hours minimum before grouting. Epoxy grout is applied to dry surfaces. When forming allow enough area on one side to provide adequate clearance for pouring the grout. The forms should be “water-tight” to prevent leakage of the fluid grout. Be sure to pour from one side only to prevent entrapment of air. A grout chute or head box will make installation faster & easier. For larger jobs, it is more effective to rent a mixing machine. This can reduce the grout preparation time greatly and lead to completing more holes in a shorter timeframe. Don’t exceed recommended water levels. Using excess water may result in segregation of the material and lower compressive strengths. Wet all concrete areas to be grouted thoroughly for 24 hours minimum before grouting. Otherwise, water will be drawn from the grout too quickly, interfering with proper curing. Don’t place epoxy grout when water is present (once cured, water is no problem). Design for thin sections, avoiding large grout pours. Use a 3-Part epoxy for cross-sections thicker than 1” under steel plate or machine beds or in large anchor pockets. Be sure grout forms are coated with grease or mold release to allow removal of grout forms.